The size of Royal Moby during its growth is rewarded with the yield that can be harvested. Indoor growers can expect 60 g per plant or 600 g per square metre under a 600w light. Grown outdoors it needs lots of sun, like along the Mediterranean; however, it can also be grown in extremely hot, tropical environments. In these conditions, these 3 m tall plants can grow up to 1000 g per plant. 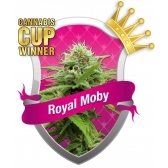 In both cases, indoors/outdoors, Royal Moby likes to grow big and will need lots of good nourishment to help it.